I was never into baking cookies at home as I thought the recipe involves lot of work. Only after entering into this blogging world, I am experimenting with all sorts of recipes. Butter cookies are the one I always wanted to bake. 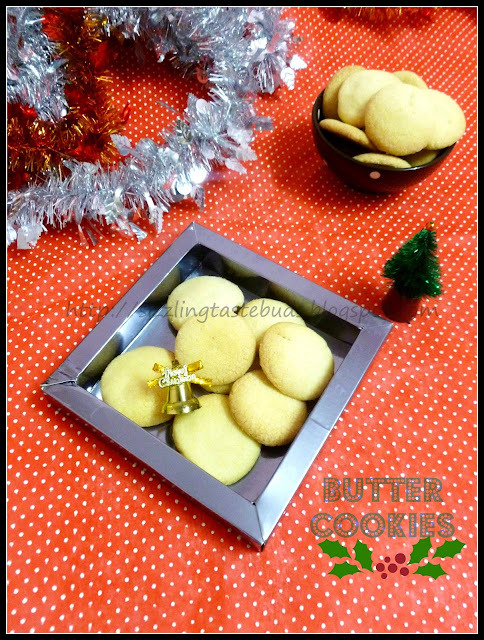 The moment I saw Sanjeev Kapoor's Butter cookie recipe, I was straight into my kitchen for gathering the ingredients for the cookies. Its a heavenly feeling to have a aroma of this freshly baked Christmas goodies at home. I was given a thumbs up by my family. That's what matters a lot to me. The best part of this recipe is that once you have the cookie dough ready, you can always refrigerate it and use it whenever required and that was exactly what I did. 1. Take Butter in a mixing bowl and add icing sugar to it. Using an electric blender, cream the mixture. 2. Add few drops of Vanilla esssence and blend again. 3. Sift Maida and rice flour together. 4. Add this sifted flour mixture to the butter - sugar mixture little by little and blend lightly till well combined. Now refrigerate the mixture for 45 mins. 5. Remove the mixture from refrigerator and make small balls out of it. Pat them lightly and shape them to form small cookies. 6. Preheat the oven to 180C. 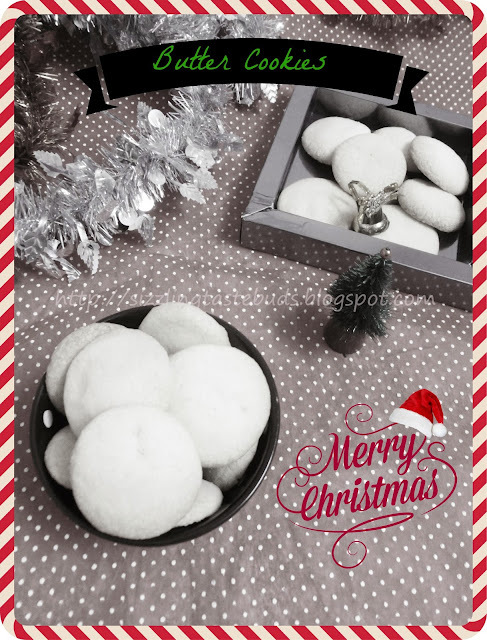 Meanwhile, place the cookies on baking tray in a criss-cross pattern and bake it for 20 -25 mins. 7. Once done, remove from the oven, cool and serve. Crispy, delicious, buttery flavored cookies are ready to be served. 1. Butter should always be at room temperature. 2. You can also add choco chips and other nuts to this basic cookie dough and enjoy different cookie flavors. 3. If you are re-using the dough after a day, just remove the dough from the refrigerator and wait for 15mins till the mixture becomes little soft. Knead it, shape it into cookie shape and bake it. 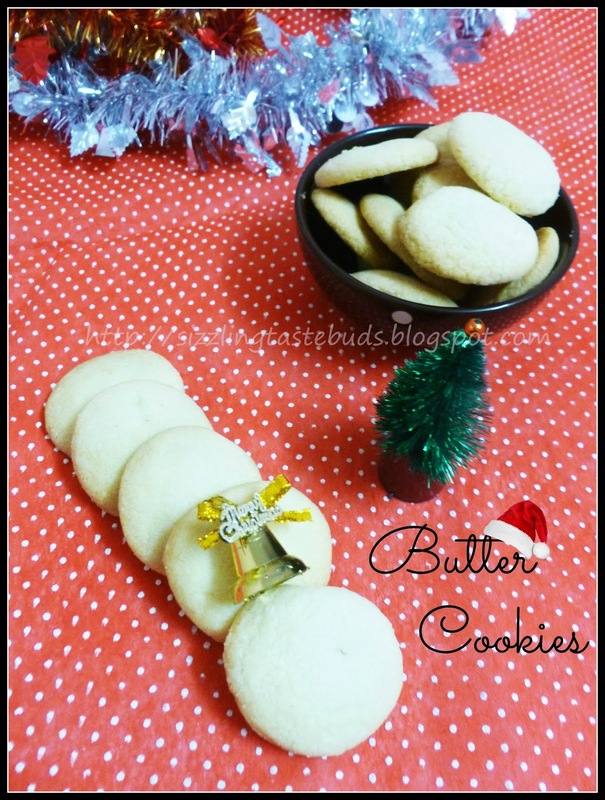 Butter cookies looks so yumm.